The above equation has of course analytical solution, but let us use a MATLAB ordinary differential equations solver to find a numerical solution. Generally it is a good idea to start with the solver that has the highest order – in our case it will be ode45 based on the Runge-Kutta method. We will also consider another solver, ode15s, which is designed for solving stiff systems. 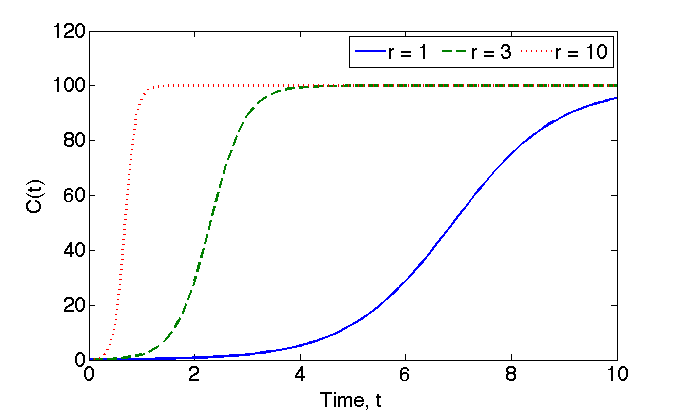 We fix the value of carrying capacity K, initial condition C(0), and time interval in which we solve the equation. 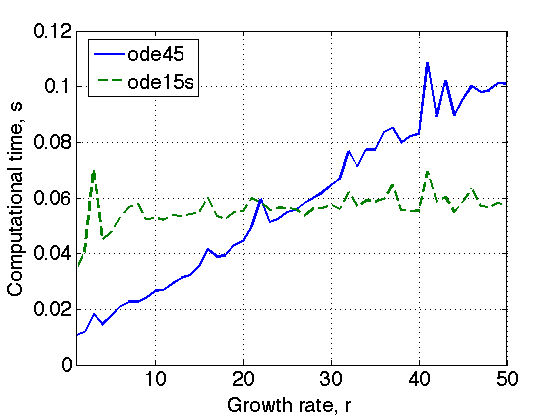 We will investigate the performance of both solvers for different values of growth rate r. The plots below show that for lower values of growth rate ode45 outperforms the ode15s, but situation changes when the growth rate is large (while keeping small relative difference between the calculated solutions). 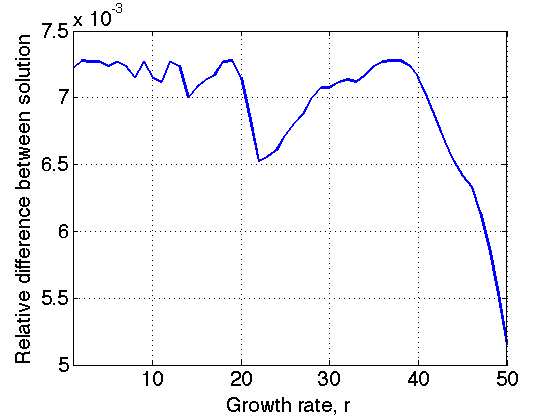 That transition in solvers performance can be explained when one looks how solution changes for different values of growth rates (see figure below) – the larger the growth rate the steeper the solution. Stiff solvers, like ode15s, are designed to effectively deal with such phase transitions. So, if we need to consider parameter dependent performance of the numerical solvers for differential equations, should we do the same for agent based models of cancer growth? Should we create parameter dependent implementations and switch between them on the fly? I think that yes, and I’ll try to convince you with the simple example below. Let us consider a very simple CA: cell can either divide or migrate if there is a free spot – nothing else. We can adapt the very basic C++ implementation from the previous post as a baseline: we have a boolean matrix (in which value true indicates that the spot is occupied by the cell) and additional vector of cells keeping information about locations of all viable cells present in the system. 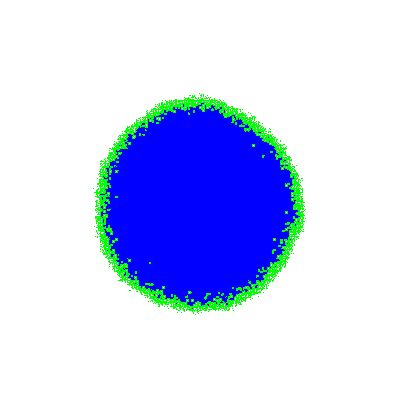 At each simulation step we go through all of the cells in a vector in random order and decide about faith of each cell. Depending on the proliferation/migration rates we can imagine that the tweaked code will have different performance. For low probability of migration event only cells on the tumor boundary will have some space (green cells on the left figure below) and we save a lot of time by dropping quiescent cells (blue cells in figures below). 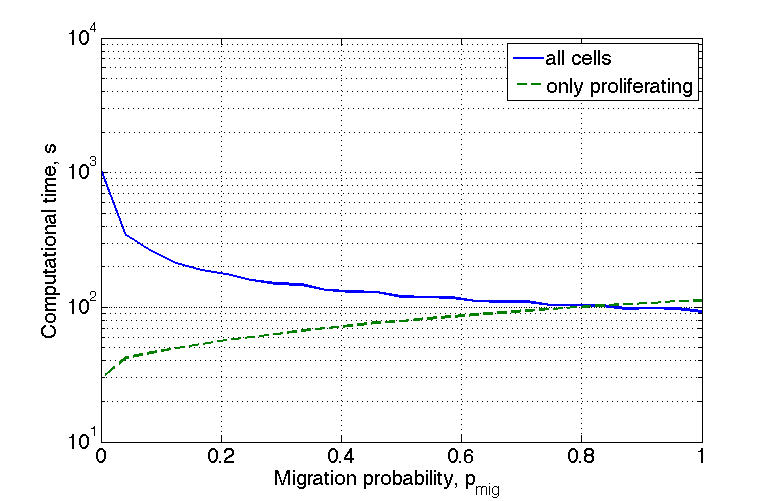 For higher migration rates, however, less than 30% of the cells are quiescent at each proliferation step (compare right figure below) and the benefit of dropping cells can be outweighed by the after migration update steps. 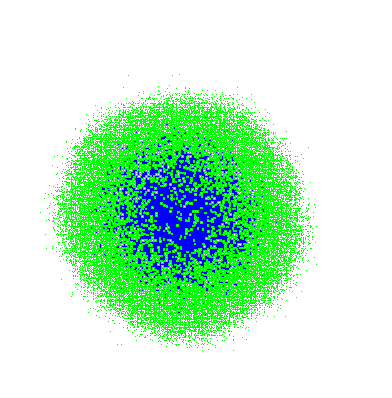 The plot below shows the computational time needed to reach 500,000 cells when using the baseline code (all cells, blue line) and tweaked one (only proliferation, dashed green line) for a fixed proliferation probability. For lower proliferation rates change in the performance would occur even earlier. I think that this simple example show that we always need to think how our model will behave before choosing the way to implement it. Values 0.1 or 0.4 are reasonable – in the example above I was focusing on the ODE solvers performance and didn’t care about real growth rates values.